BW Social Share is an easy to setup and customize social share buttons Joomla! Module - ready to use in responsive layouts. It uses the "Ridiculously Responsive Social Sharing Buttons" jQuery library by Kurt Noble http://kurtnoble.com/labs/rrssb/ (MIT Licensce). Thanks to Kurt Noble! If no Social data provided, it grabs it from Meta title, Meta description (for details see below). Optional: Adds Google Universal Tracking Coder like this: onClick="ga('send', 'event', 'socialshare', 'click', 'facebook');"
Assign Social Share buttons to a group of pages - with same settings for all pages - or let the module automatically grab the meta title and meta description of an individual page. Title: "Get free Responsive Social Share Buttons Joomla! 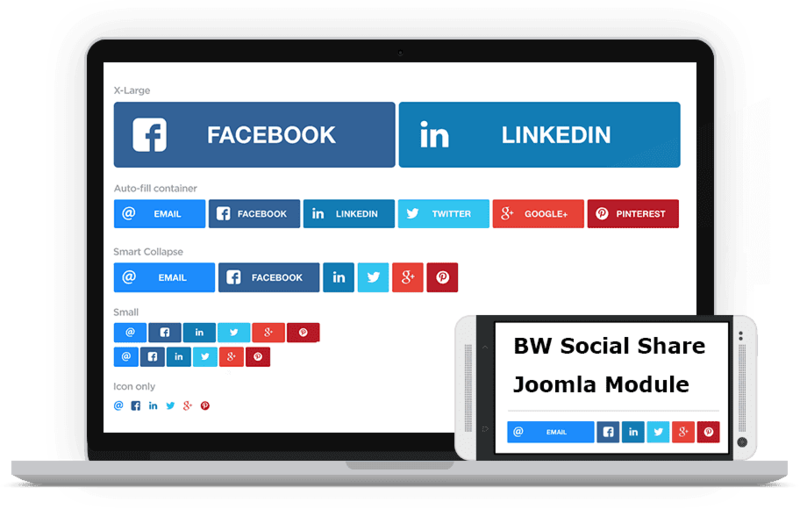 Module"
Description: "The new BW Social Share Joomla! Module adds awesome looking responsive Buttons to your Joomla! Website. Easy to setup and configurable for individual pages. Check it out now! " Path: URL to the page; if empty the current page URI is used. Box Title: Text above the social buttons; It can be used for a call to action to socialize. RAW data is allowed. Button Style: "Default:" buttons shrink on small screens. "Just small": shows buttons with just the icons - and without text. Hidden feature (for programmers only): for title, description, image and path the module will look in the Session for an array called "open_graph" like this: array('og:title'=>, 'og:description', 'og:url', 'og:image'=>); If these values aren't null they will be used instead of META data. Currently the following Social Web Services are included. You may configure the Button text (but not the social icon). Tip 1: Install Perfect-Web.co Open Graph and Twitter Card Tags to get best results with Social Share. Tip 2: Assign BW Social Share buttons to just about anything you want by using i. e. RegularLabs Advanced Module Manager extension for this. Tip 3: If your using SEBLOD™, check this article on how to add Open Graph Metadata on SEBLOD™ content types. Consider to implement the hidden feature mentioned above. Tip 4: Use the following testing tools, to discover errors on your meta data for social shareing. Please, support this extension and review on Joomla! Extension Directory JED!